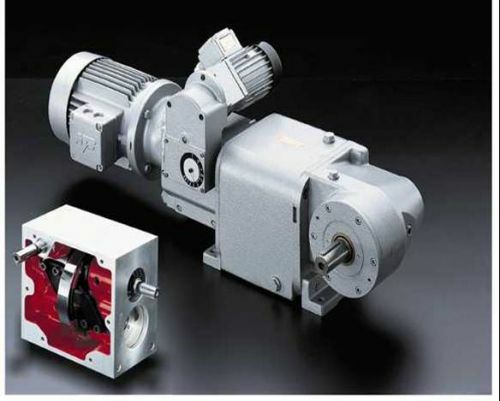 The Heynau H-Drive is one of the most well known mechanical variable speed drives. The simple construction of this all steel drive with only a few components, meets the highest requirements for quiet operation, precise speed holding, high efficiency and durability. The drives utilize a set of cones, which transmit power via an encapsulating steel ring. By adjusting these cones in relation to the steel ring, a speed adjustment range of 6:1 or 9:1 can be achieved ( 3:1 reduction and 1:2 or 1:3 increase). This speed range can be realized while the machine is at rest or in motion. These drives can be arranged with input and output reducers to achieve hundreds of speed and power ratings. Motors can be attached to the input for complete drive packages. For lubrication, power transmission and good heat dissipation, a special Heynau "Long-Life" oil is used. The qualitites of this oil produce an "elasto-hydrodynamic" effect, which prevents direct metal-to-metal contact between transmission surfaces. The result is a high abrasion resistance, which makes an oil change unnecessary.